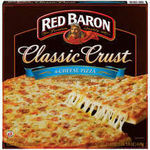 My favorite pizza of all time, period! 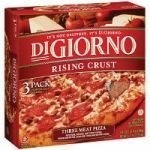 All-meat pizza has always been my top favorite kind since I was a kid, whether it's from Pizza Hut or the frozen food aisle, and you CANNOT get any better than DiGiorno all-meat with the rising crust if you don't want to spend the money on delivery! 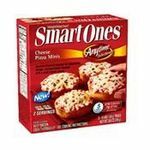 Seriously, it's DELICIOUS, with the taste of the crust and the tangy sauce and the pepperoni and sausage...it's so easy to take out of the freezer and bake in the oven to just how you like it! SO worth buying! DiGiorno is the best frozen pizza brand out there. The rising crust is probably their best product. The one negative about this particular product is the flavor of the sausage. Something is not quite right. I would try this product to see if you like it, but some people will not like the "bite" of the sausage used. 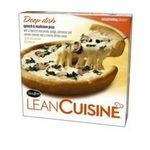 Everything else about this product is exactly what you expect from frozen pizza. The hubster is a meat and potatoes kinda guy. He loves pepperoni pizza, I like sausage pizza. So we compromised when we found this pizza in the frozen food section of our market. They have Pepperoni and Sausage pizza but we bought this one because it added beef as a topping and we thought, why not? I'm not a real fan of box pizza because they just never taste the same as delivery, no matter what the advertisements on tv claim. But once it a while, buying a frozen pizza to pop into the oven to save time is not so bad. Another bonus for me is the rising crust. I don't like flat pizzas. If I wanted pizza on a cracker, I'd make one. Pizza has to have a thick or at least SOME crust to it. After unwrapping it and popping it into the oven, it came out pretty good. But it was tremendously salty. What can you expect with two our of three of the meats were salt cured meats? You can't have it all. But I can surely dream about it. I truly enjoy the DiGiorno frozen pizzas. I wait of course till they are on sale and get them for 5.99 a piece or sometimes they have a coupon for the package of three at Costco. I never order home delivery, and my favorite pizza in the area doesn't deliver. So when I am in the mood for pizza , but don't feel like driving down the road, it's DiGornia for me. The quality I feel is wonderful, and I usually get two meals from one pizza. I like the sauce and the meat on these as they don't taste frozen, and I don't think the crust tastes like carboard like so many frozen pizzas. DiGiorno is excellent frozen pizza! 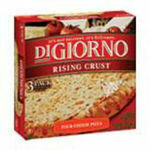 MY family and I had Digiorno's Rising Crust Three meat pizza for dinner last night. This was not our first experience with DiGiorno pizza and it definitely won't be our last. The box itself is not eye-catching when you are shopping in the store. I knew before I went what I wanted, but if you were not lookign for it, it would not catch your attention. That being said, when I was ready to cook it, I opened the box and got the pizza out and WOW! This pizza looks so mouth-wateringly good BEFORE you cook it, it's hard to let it go for it's 25 minutes in the oven. Now, for actually eating it - yum! The crust rises, but also remains soft enough to eat, which is a big plus. The sauce they put on it has a hint of sweetness and they give you plenty of it. The topping are the best part and what I think makes this pizza 'just like take-out/delivery'. They really go all out in giving you ample toppings and they always cook wonderfully. It really is just like delivery. The only drawbacks I can think of is that 1.) It is on the expensive side, but worth it. If you can find it on sale, grab it! That's when I buy it. and I try to stock up. And 2.) It could be a little bigger. I guess it's standard frozen-pizza-size, but it just covers my husband, myself, and our 4-year-old. Yet to make a 2nd one would be too much. What can you do? Otherwise, highly recommended as our family's favorite frozen pizza.